When we went to Singapore, in 2005, one of the things the travel book advised was to try the kaya toast. Kaya, it went on to say, is an egg-coconut custard, spread on toast. The difficulty arose in trying to find a place that served it, and we finally hunted down a place about a mile away from our hotel after asking the concierge and a few people on the street. It was worth it! One of my fondest memories of the trip is that of our then 4 year old testing out the kaya and deciding it was edible. A week or so ago I was trying to find something to do with a few limes, and started googling for "lime," "coconut," "jam," and "preserves." I came across a few recipes for kaya. They w ere all basically the same: 10 eggs, 1 cup of sugar, and a can of coconut milk. However, none of the recipes are all that explicit as to what happens after you put it in the jars. Do you refrigerate it? Store it at room temperature? How long does it last? No clue. So for this one I'm winging it a little. Tonight I made the custard, put it in the jars (it made 3 half-pints and a little extra) and decided that I should process it at least a little. I put the jars in the hot water and brought it to a boil and processed for about 3 minutes. The jars have popped and hopefully it will have a decent shelf life. Thing to remember: the coconut milk has little bits of coconut in it which should be filtered out. The kids won't touch it but the grown-ups love it! Just had some of the leftovers on toast... mmm. So after opening up a jar which had been processed I'm thinking the rest should be refrigerated. The consistency was fine, the seal was intact, but the kaya had turned slighty greyish. It smelled and tasted fine, too. 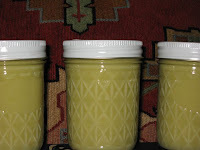 However, I found a website (http://www.uga.edu/nchfp/how/can_02/lemon_curd.html) which talks about canning lemon curd for at least 15 minutes in a boiling water bath, this is nowhere near as acidic. So, into the fridge it goes! You are much more daring than I am... I'm not sure I'd ever get Husband to try this, but I may live on the edge this summer and give it a whirl! I despise coconut-proper, but love coconut milk (at least in rice and curries) so I think I'd love it. I have a feeling I would love kaya. I love custards and coconut. I am trying this one! Have you tried it again? We are on our 3rd batch of canning kaya (my husband is singaporean) we have still not got the canning part right...it bubbles when it has been cooked for 15 minutes in the can. Those bubble pockets supposedly can cause it to go bad...I would love to hear how things went for you. Hi, Monica, I haven't. I would love to know if there is a better way to can it. I still don't understand why it turned grey. Got any ideas? Just found your blog post and I'm intrigued by the possibility of being able to can kaya. I've had the canned yeos brand kaya in a tin but it has other ingredients that maybe help it keep its smooth texture while being processed at high heat. Have you successfully canned yet? No. I think ultimately it wasn't acidic enough to can with a boiling water canner and I never got back to trying to pressure can it. Commercial canning can get higher than even 240 degrees, that's how they are able to can dairy-based things (which are considered unsafe to can at home because we can't get it hot enough). While kaya isn't dairy-based, I'm not sure what would happen to the eggs! I happened upon the recipe for kaya in a cookbook and immediately wondered if it could be canned. On that recipe, it states it will keep for a week in the fridge. It sounds yummy but, as I am a single mom to one picky eater, I can't justify the waste. Anyway, I googled it and here I am! I was raised canning foods but hadn't done it in years as my life was too busy. Then, after losing three freezers full of food when we experienced power outages after hurricanes (Two in the same year! ), I decided canning was worth the time. Needless to say, I'm so glad I found your site.